We would all be aghast at a parent who went on a shopping spree with no intention of paying the credit card bill when it arrives. 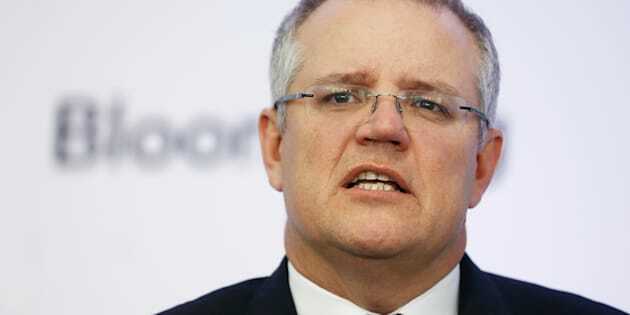 On Monday, Treasurer Scott Morrison brought down the Mid-Year Economic and Fiscal Outlook. We would all be aghast at a parent who went on a shopping spree with no intention of paying the credit card bill when it arrives. But that is exactly what we are collectively doing right now with our string of budget deficits, which mean the current generation are accumulating debts that their children will need to repay. An Australian born in 2008 will need to wait until their teenage years before they experience a budget surplus. And that's if the government's revised targets for spending and revenue are met. Prolonged budget deficits mean that long into their adulthood, that child will pay the price for the collective reluctance of our current generation of politicians to make the tough decisions needed to curb spending. On Monday, Treasurer Scott Morrison brought down the Mid-Year Economic and Fiscal Outlook, giving an update on the state of the nation's finances. While the Treasurer reaffirmed that Australia would return to surplus in 2020/21 (by a narrow $1 billion), the figures demonstrate that the path to surplus has become even steeper. There's plenty of responsibility to be shared around. Both Labor and Coalition governments have delivered budget deficits over the past decade. And the Coalition's efforts to cut spending have been made more difficult by sustained opposition to its measures by the Senate. MYEFO has shown the choppy waters being navigated by Mr Morrison. Since the election, he has rightly continued the Government's efforts to curb spending by ensuring that government decisions improve the budget bottom line by $2.5 billion over four years. It is particularly pleasing to see that spending as a share of the total economy is down from the earlier projection of 25.8 percent. At 25.2 percent it is still higher than the business community would like -- we call for spending to be under 25 percent of GDP -- but at least it is heading in the right direction. There is some cause for hope. In recent months the Government and Opposition have worked collaboratively to boost the budget bottom line, with total improvements reaching $22 billion. This shows that if the impact of spending cuts is shared fairly throughout the community, political parties are willing to act in the national interest. But there are still billions of dollars in unlegislated budget repair measures that remain blocked in the Senate. There is some cause for hope. In recent months the Government and Opposition have worked collaboratively to boost the budget bottom line, with total improvements reaching $22 billion. The Treasurer has rightly avoided the temptation to reach for economy crushing tax increases to improve the budget. The Government must stand by its commitment to cut the company tax rate to a more internationally competitive 25 percent for businesses of all sizes. The Government took this policy to the election and the Parliament should allow it to be put into action. We know from Treasury that two thirds of the benefit flows to households, making it a vital tool to improve wages and the prosperity of all Australian families. Some people may argue that the state of the budget means it is not the right time to cut company tax. What those critics ignore is that cutting the company tax rate will spur economic activity, creating jobs and ultimately growing the tax base. By starting with tax relief for hard-working small businesses, and setting a clear glide path for future tax cuts that extend to larger employers, businesses can invest and hire with greater certainty, delivering economic benefits today for tax cuts that might be several years in the future. Under current projections, the biggest impact from the company tax cuts occurs when our budget can afford it -- when it returns to surplus. And with Donald Trump's United States and Theresa May's United Kingdom both planning to aggressively cut their company tax rates, Australia cannot afford to be left behind. Given the sluggish state of the global economy, Australia needs to do all it can to get its budget in shape. To prepare for shocks from abroad, which can be particularly powerful for Australia's export-oriented economy, we need a budget position that allows for policies that gives Australia buffers and supports domestic growth. Given the sluggish state of the global economy, Australia needs to do all it can to get its budget in shape. We cannot rely on a falling exchange rate and temporary increases in commodity prices to boost our economy. Instead we need to take our destiny into our own hands by putting in place policies that improve our economic competitiveness in areas including infrastructure, apprenticeships and workplace relations. Support for infrastructure has become a motherhood idea in Australian politics, but we need to be smart about the way we do it. Rather than allowing infrastructure spending to be a political exercise, we should empower the independent Infrastructure Australia to provide guidance on which projects will deliver the most bang for the buck. Through improving the way we spend taxpayer funds we can win the trifecta: curb our spending, improve Australia's prosperity and ultimately bring our budget back to surplus. For the sake of future generations, we need to act now.